A great space in leafy Surrey. After nearly 20 years in London, Adam moved his Studio out to leafy Surrey in early 2013. Adam and his partner Sue love living in the country, with woodland walks on their doorstep and lots of country pubs nearby. Their cocker spaniel Archie also appreciates the wide-open green spaces after seven years pounding the pavements in London! West Horsley is the perfect location – just 15 minutes from the beautiful, historic town of Guildford, and less than an hour by train or car from London. The Studio is just five minutes from Horsley train station, on the line from Waterloo to Guildford, and we are happy to arrange to pick up/drop off course students or customers at the station if driving is not an option. There are a number of National Trust properties within 5-15 minutes of the Studio, including Hatchlands and Polesdon Lacy, and we find that some visitors like to combine a visit to us with a trip to one or more of these amazing historic houses. The 2,400 sq ft Studio is large and airy with high ceilings and plenty of natural light. 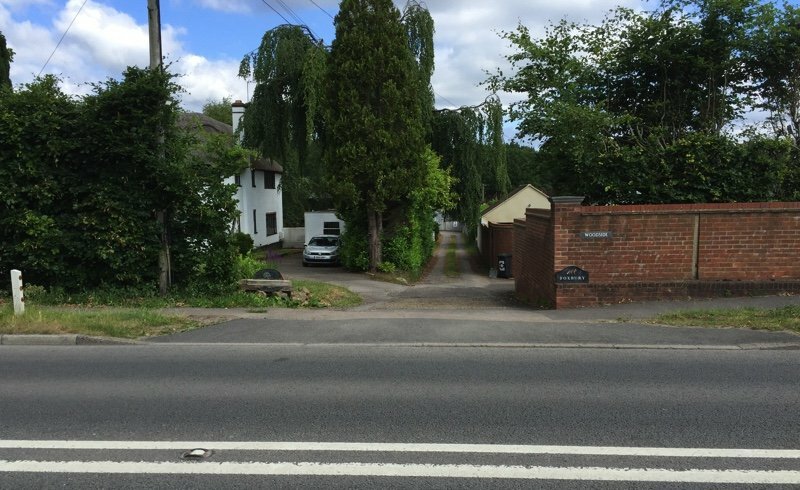 It is down a small lane off the main Guildford to Leatherhead Road (A246), and there is plenty of space for visitors to park, with an outdoor seating area for refreshments in the warmer weather. Scroll down for more details and directions for how to find us. The studio will be closed for our spring holiday from May 7th 2018 for two weeks. We will re-open on Monday May 21st 2018. We are available on email during this period, so please feel free to contact us if you have any questions. We are usually open every day of the week (10.30am to 5pm), but it is always worth calling ahead to make sure we are there as sometimes we are away at exhibitions or fairs, or we might even be on holiday! During weekdays, our dedicated team of three staff, led by master glassblower Eddie King, make glass the traditional way, by hand, either working with Adam in a team, or making some of the pieces designed by Adam. Eddie started glassblowing as an apprentice at Whitefriars nearly 50 years ago. He is a very experienced and skilled maker and has also worked for Wedgwood Glass, Langham Glass and Edinburgh Crystal during his long career. Gabi Ignacio-Madrid came to work with Adam in London in 2011. He grew up in Majorca where his father has been a glass artist for many years. Gabi and his partner now live in Surrey with their baby daughter. Will Rapley joined the team in June 2016 as a novice and in a short space of time has developed a wide range of skills. 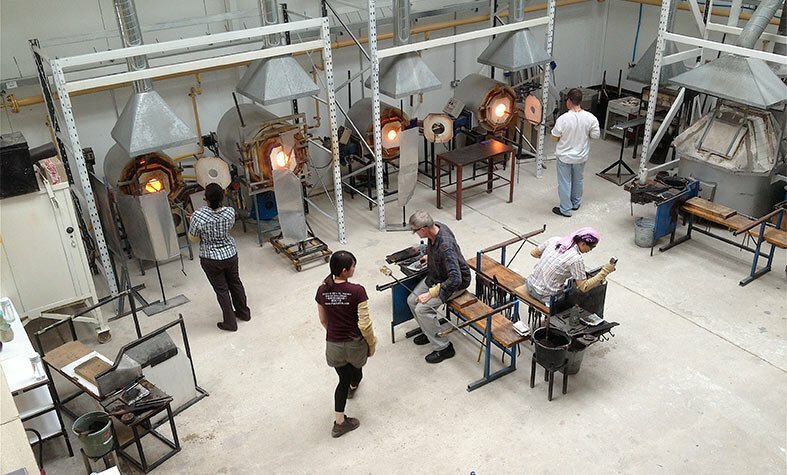 He works with the team for three days during the week, and at weekends, assists Adam with his students during his half-day weekend glass courses. The studio is an active participant in the local Surrey Arts scene. Adam is a member of the Surrey Guild of Craftsmen, Surrey Sculpture Society, Guildford Arts and we are sponsors of West Horsley in Bloom, an annual event for which Adam makes a special trophy – The Judges’ Award. Adam was recently honoured to have been invited as the guest speaker at the West Horsley Parish Council’s AGM 2015. We are looking forward to the biennial West Horsley Summer Fete in September, where we will have a stand. During the past year we have arranged demonstrations for a number of groups, including nearby Cranmore School and Bookham DFAS among others. Adam Aaronson Glass Studio, Foxbury Barn, Epsom Road, West Horsley KT24 6AR. From the East: look out for Squires Garden Centre on the right. The entrance to Foxbury is immediately after Squires and is a sharp right turn. From the West: look out for a wooden footbridge over the road. The entrance to Foxbury is the second driveway after this. If you reach Squire’s Garden Centre, you’ve gone too far. Farm and has small white marker posts. Access lane to Foxbury Barn: To confirm that you are in the right drive, as you drive down towards Foxbury Barn, the house to the right hand side of the drive is called Woodside and has solar panels and the house to the left hand side of the drive is called Ashwood House and has a thatched roof.